Criteria, Immediate and Scheduled Actions. Create Records:In addition to updating a record, you can create a record and set the field values within the record. Create Chatter Post: Push a chatter update into Group or Feed. Create an approval:Traditionally you needed a trigger to push a record into an approval process automatically. With Process builder, you can do this automatically based on criteria of the process. Quickly consolidate Workflow:Quickly consolidate multiple workflow rules that in one process. Call an Apex Class:You can now call an Apex class. A trigger is the piece of code, that is executed Before or After a record is inserted or updated. Need to design test classes to meet required test coverage. Editing: User can’t edit process once it has been activated.Therefore much like with flow, a new process needs to be created by cloning the initial process and making modifications to that cloned records. Validation: Processes DO NOT trigger Validation rule and can, therefore, invalidate data. Error Message: You can’t specify error messages when creating a process that doesn’t trigger as you can with flow or validation rules. Syntax: Pick-list fields are evaluated as text fields in process builder so that they won’t support any pick list formulas like ISCHANGED or ISNEW. Apex code must provide exception handling. Don’t use SOSL and SOQL inside for loop. Check: To see if there are any workflows on the object doing the same things as the process. Also, verify no active Apex Trigger. Avoid: Interviewing Apex, workflows, and processes together for the same process. Document: Use the Description field to populate information such as when it was created by who and what the process does.Also, if processes work in conjunction with each other. Test: And then test some more.Especially when you are first starting to use this please practice in the sandbox first. There’s a lot of ability to impact users and data here if you do something wrong. Now the question is Why Process Builder and how is it differ from trigger? Process builder is fully customization. No code required here because we require lengthy logic and record to complete and fulfill the requirement or if we using process builder it will take less time to complete the requirement. Traditionally required a trigger and It can be done easily with process builder. The issue is Multi layer lookup logic- i.e. multiple / nested maps of related data required in the trigger. Process builder ✓Trigger Traditionally been something that requires a Trigger. Process builder allows administrator can do this without the use of the code. ✓Trigger Process builder can be used to assign ownership of records based on criteria in the object. ✓Trigger Process builder can be used to post to chatter based on record criteria. Submit a Quote for Approval when Opportunity Stage= Proposal Process builder ✓Trigger Requires 2 Processes one to Update the Quote based on the opportunity stage and another to submit the quote for the approval when the criteria on the quote had been met. ✓Trigger Process builder can be used to set record criteria and then launch a trigger ready flow. ✓Trigger Although Process builder can create a new record it can’t reference any of the values from the cloned opportunity without the use of a flow to capture the opportunity values. Allow Contact to copy Current User Address in Contact Address and Account Billing Address only when any address field(Street, Country, state )is blank/NULL. Make your Process-builder on Contact Object. Provide the criteria as Contact.Mailing Street (IS NULL = FALSE) and likewise for every address fields of Contact and Opportunity. Now test this process builder in your org by leaving any address field blank in your org. After leaving Contact address blank here is the address which got autofilled same as contact’s owner address. Similarly you can test this for your Contact’s Account. 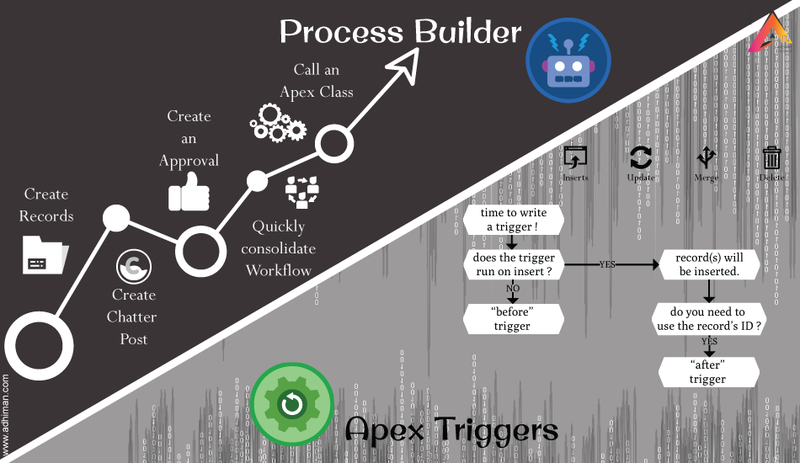 This is the reason for using Process builder rather than using Apex. But in some scenarios you’ll have to write trigger code where process builder can’t be. Create a checkbox field “SAME COUNTRY AS USER & COMPANY”. Throw error when a Contact is getting inserted in Salesforce having Country same as User country and Company country. Above example can’t be done via Process builder since this do not allow you to throw error while inserting Contact. Create Checkbox field named “SAME COUNTRY AS USER & COMPANY” on Contact. Rapid Iteration In Process Builder Can Be Challenging.